Lantek, global supplier of CAD/CAM/MES/ERP solutions will show the latest novelties incorporated into its software at MetalMadrid2015. This event is specialised in the industrial sector and it will be held on 4th and 5th November at the premises of IFEMA in Madrid, where many manufacturers and specialised companies in machinery, supplies, materials, engineering and outsourcing, among others, will meet together. Increasing precision in time calculation and fostering advances that will lead to an improvement in productivity in the metal industry, have been some of the guidelines that Lantek has taken into account to fine tune its solutions. These are aspects that those attending MetalMadrid will be able to witness and discover first hand from the company’s experts, at stand B10, pavilion 6 of MetalMadrid. - CAM 2D optimised to guarantee precision in time calculation of laser machines, thanks to the new setup parameters and to the algorithms incorporated, which permit taking full advantage of modern machines, optimising the planning and production processes. It has also been provided with greater flexibility for machines that have Fly-Cut mode. - More flexible and automatic text marking, which permits the easy identification of a key part of a metal sheet or of a cut-off by its position on it or the characteristics of the source. The novelties in text editing capabilities for marking are related to definition based on dynamic information, rotation, modification or elimination. - Optimisation of software usability, making it more intuitive. Now it permits importing parts, even of a PDF format plane, obtaining geometries that can be worked with, cleaning them of undesired elements and preparing an exact estimate quickly and easily. - In the CAM 3D area a complete design environment has been incorporated to process work on pipes with all the functionality that Lantek offers in its CAD/CAM systems. Likewise, both the precision in time calculation for operations on pipes and profile with five axes, and the handling of geometries, vectors, contours, heights and input and output attacks have been improved. - Access to greater resources for traceability thanks to the TrueType fonts in text marking. - Monitoring the work load and new production time estimation formulas for the Lantek offer in the Management area. - Improvements in specialised software, integrated with other systems such as StruMIS Connector, which will permit calculating the production needs without having a CNC programmer; Tekla Structures Connector, which includes new formats used in the resolution of metal structure scenarios to ensure their correct manufacture. - New integration variables in ERP Integrator, such as the organisation of operations, parameters to calculate the cost of metal sheets, geometry of cut-offs and breakdown of sets. 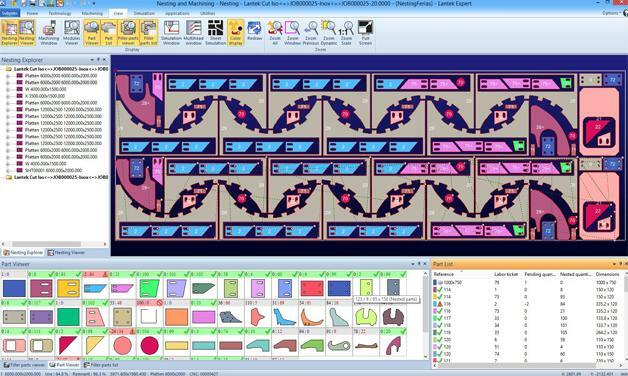 - Masterlink, a mechanism that connects CAD/CAM with the company’s existing management system, incldes advances in integration capabilities in terms of management of metal sheets and geometry of cut-offs.